This is Part 1 in a 3 part series. It might even be 4 parts. I have too many pictures! One of our parenting goals/missions for our lives in Switzerland was to take the boys to as many different places as possible. And as we reach the half-way point in our experience here we have done a pretty good job. We are constantly pouring through our Swiss guide books and surfing through websites. We also have fun “where should we go” dinner conversations. One day when we asked, “What do you want to see in Europe?” E replied that he really wanted to see Hadrian’s Wall. 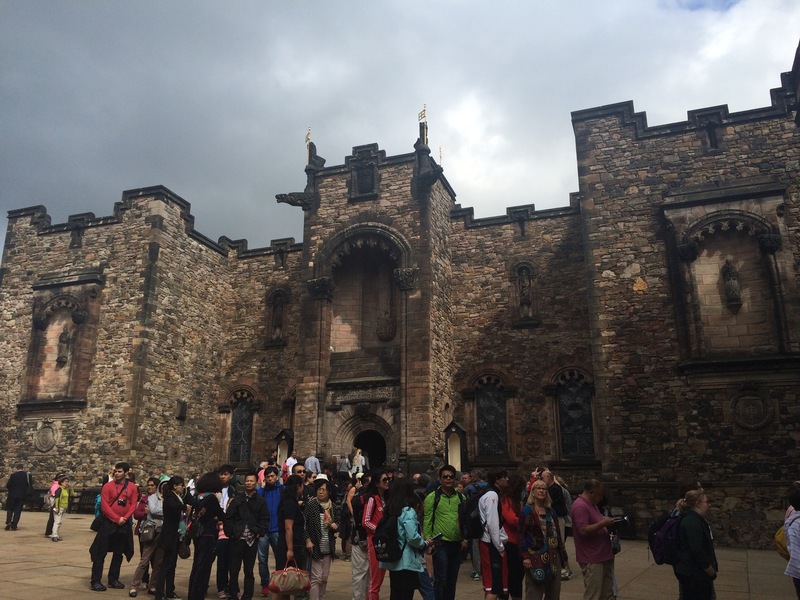 I know that Hadrian’s Wall is in northern England, but they do wonderful tours of it out of Edinburgh. I had never been to Edinburgh. Shaun, the Thema to my Louise, went years ago with some friends of ours. I couldn’t go along because E was just a baby and I needed to be there with him, but that idea of going to Scotland had remained. Plus, I reasoned, if we went to Edinburgh we could adventure into the north and see Loch Ness. And if we didn’t go now, when? Unfortunately the only fly in the ointment was that Mark had to stay and work. Stupid work. 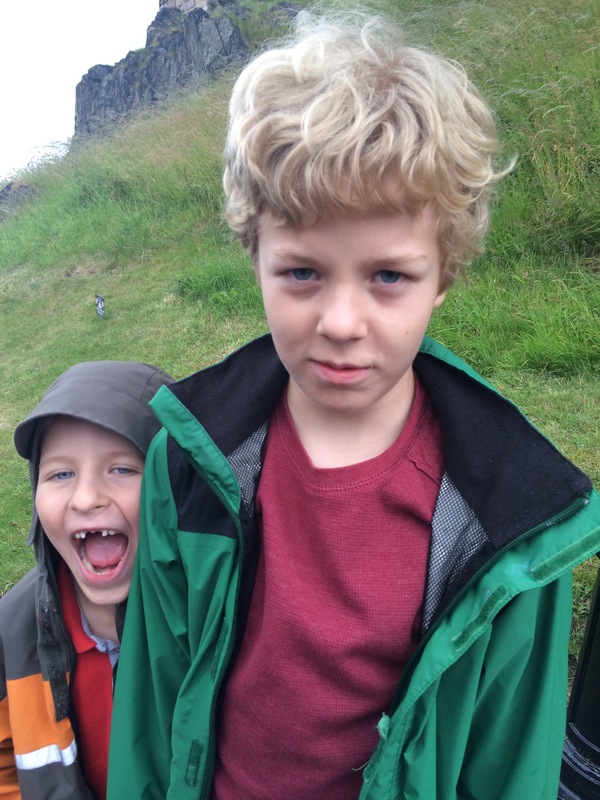 But he encouraged me to go alone with the boys and enjoy Scotland. Of course I researched the wonders of Scotland. I mean, this is me we are talking about. 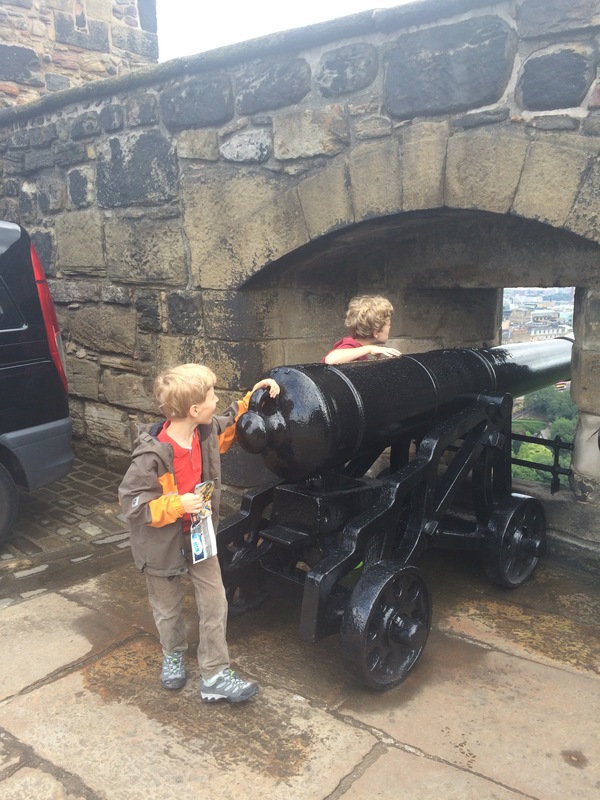 I found a great apartment to rent for the week right on Blair Street, just off the Royal Mile and an equidistant between Edinburgh Castle and Holyrood House. I signed us up for a tour to Hadrian’s Wall and Roman Ruins and then a tour to Loch Ness and the Scottish Highlands. I made a list of sites to look for. 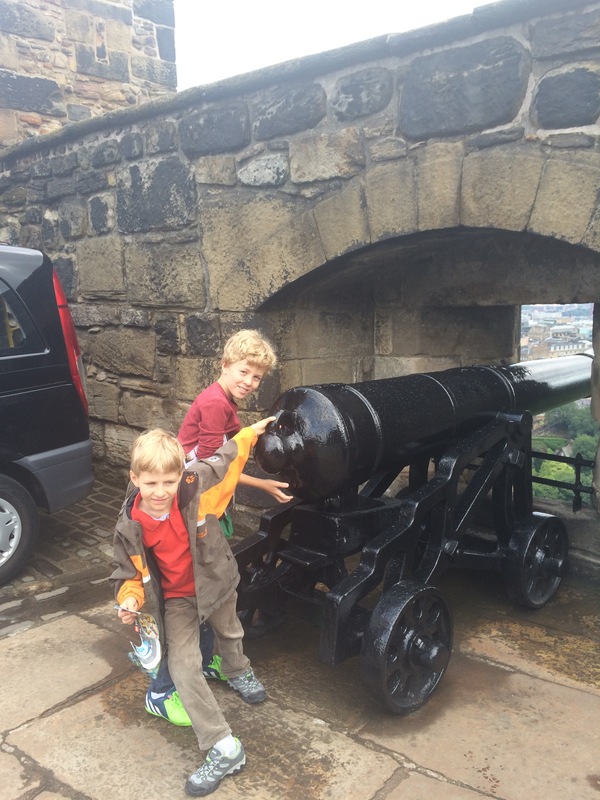 Back in April when I planned this trip going to Scotland on a solo parenting extravaganza sounded like a good idea. I bandied about phrases like “Fun!” “Educational!” and “Bonding Experience!” But the closer I got to the trip the more terrified I became. What in the hell was I thinking?? Going alone to a foreign country and being the only adult responsible for 2 young and extremely energetic boys?? I was clearly insane! I started to feel better once we go through security and passport control. It also helped that the flight was totally uneventful and we arrived at the apartment with no problems. By the time we had settled in, got the right currency, and found groceries I was confident again. 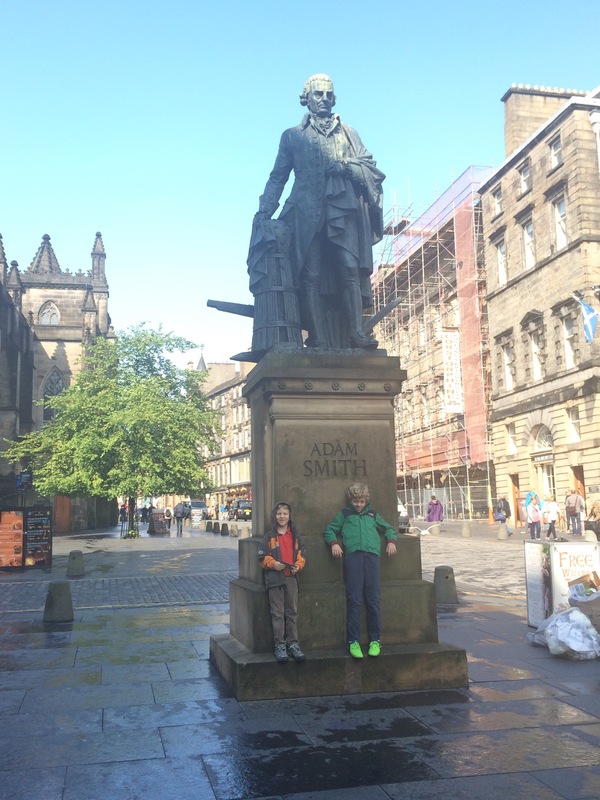 The next day we ventured forth down the Royal Mile, also known as High Street, and ran into Adam Smith. 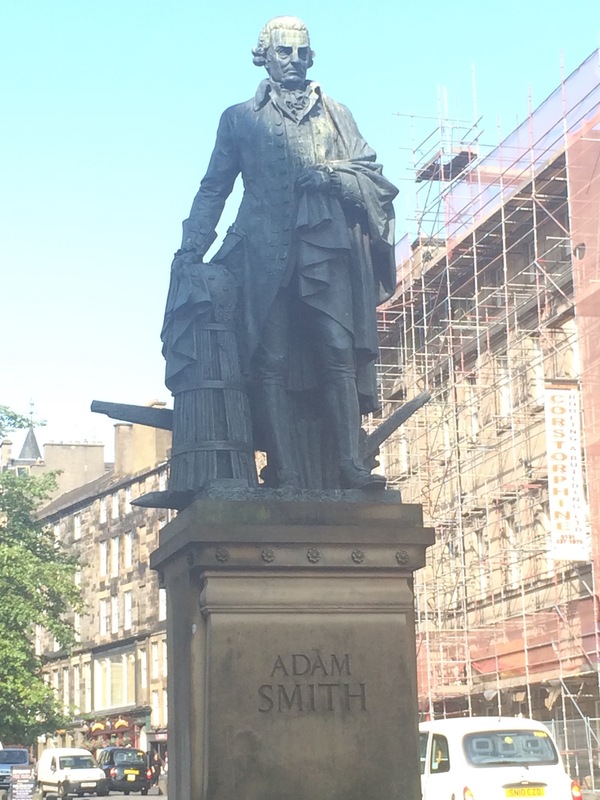 Who is Adam Smith, you ask? He is! Adam Smith was an 18th century philosopher and father of modern economics. His major work, still required reading for economics classes everywhere, is The Wealth of Nations. He is every economist’s hero. And since I live with an economist, and socialize with many economists, I had to take a picture. Or two. 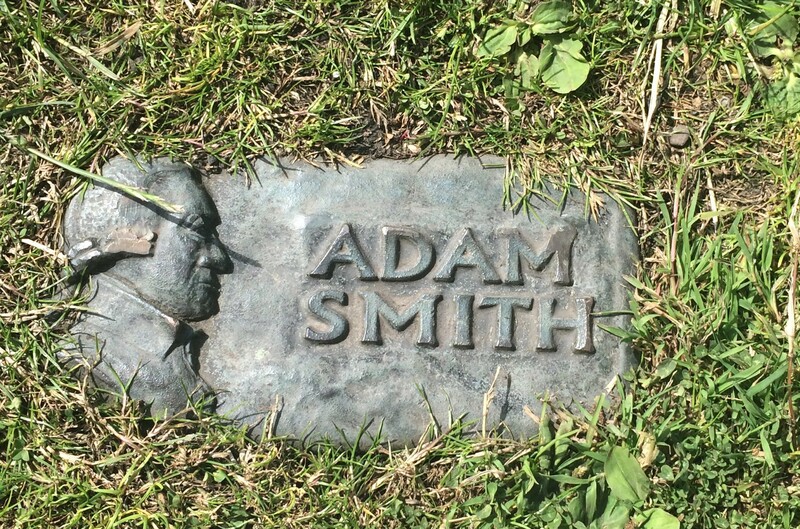 Adam Smith was a professor at Oxford and spent a lot of time in England so I figured he would be buried there, but NOPE! 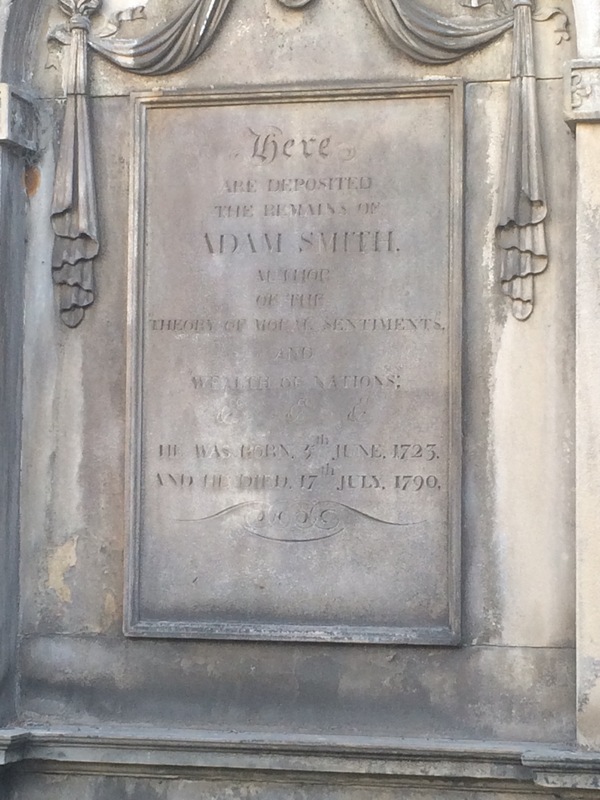 We literally stumbled over the sign at Canongate Kirkyard letting us know that Adam Smith was buried there. The little breadcrumbs that lead you to Adam Smith’s grave. 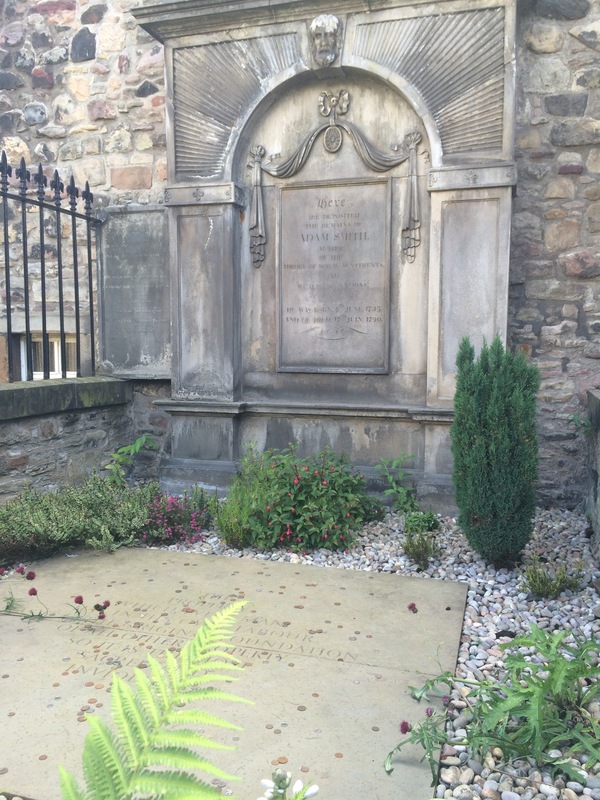 Adam Smith’s grave. 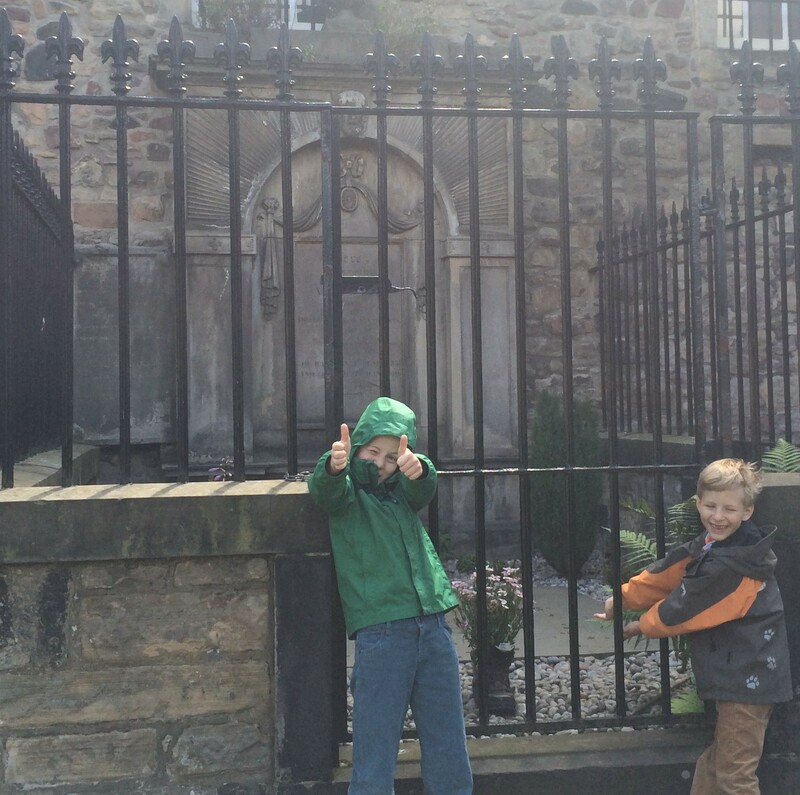 It is one of the biggest in the kirkyard. 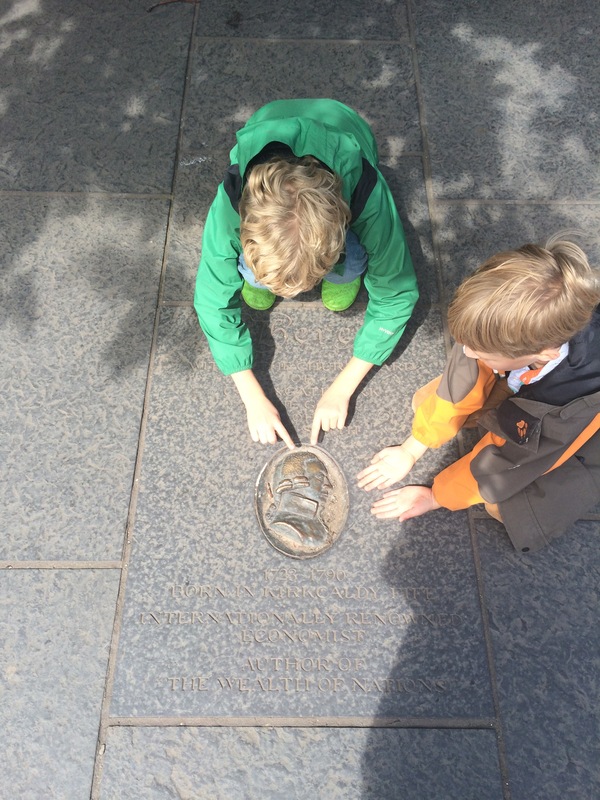 The pavement below is engraved with one of the quotes from his book “The Wealth of Nations.” As you can see, people toss pennies and pence onto it, including the children of economists. Yes, he is “deposited” here. Like money in a bank. Fitting, I think. The boys were hilariously excited to find something that Mark would like. And then, because my boys like to read every sign they pass in the hopes that one of them might say “Ice Cream Here”, we found Adam Smith’s house! He’s so important they listed his residency twice! Once on either side of the door, just in case you missed the first one. So, that was delightful, serendipitous discovery and it made Mark seem like he was with us, in a weird way. 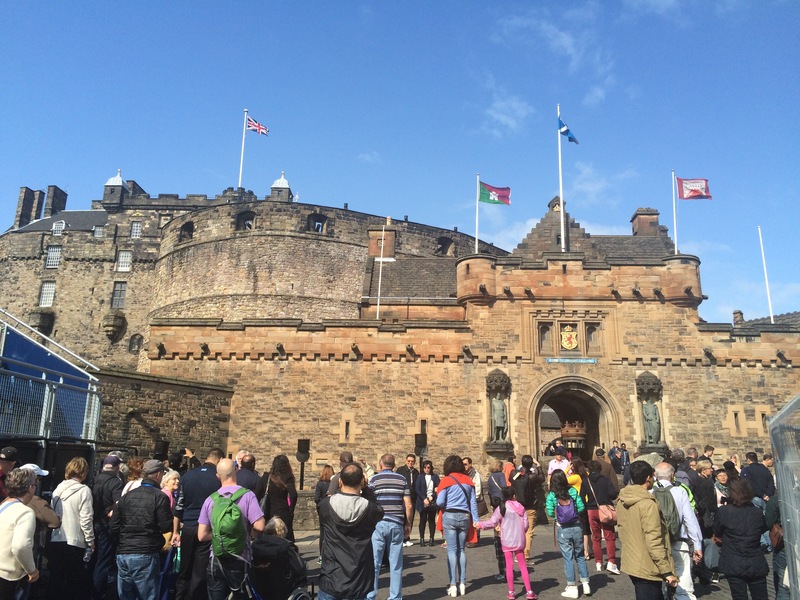 Our first actually planned destination was Edinburgh Castle, but to get there you travel down High Street, also known as The Royal Mile because it connects Edinburgh Castle with Holyrood House which is where the English monarchy stays when they come to visit. 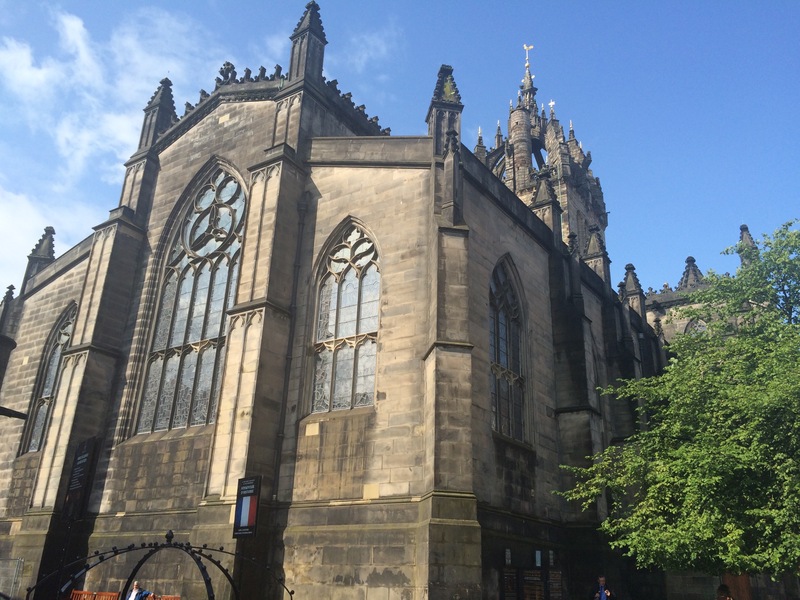 The Royal Mile is filled with Medieval architecture. 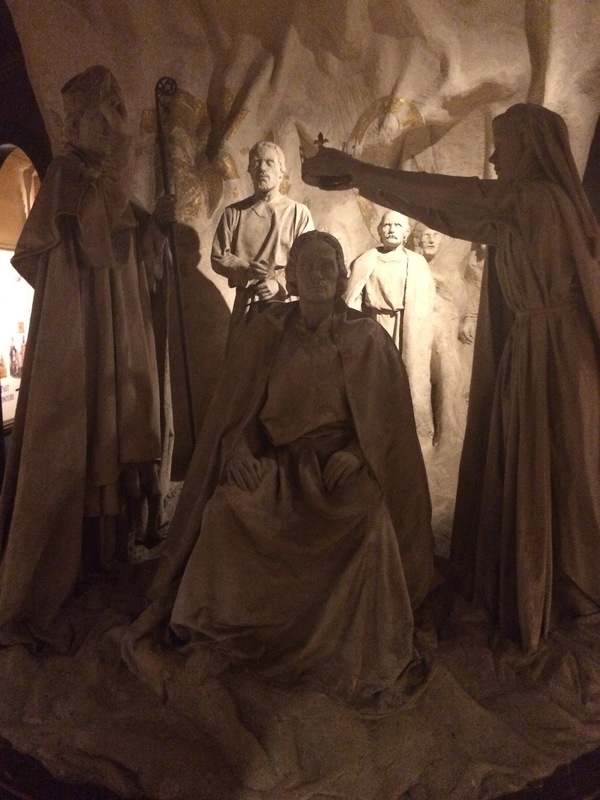 Lovely churches, memorials, and statues. 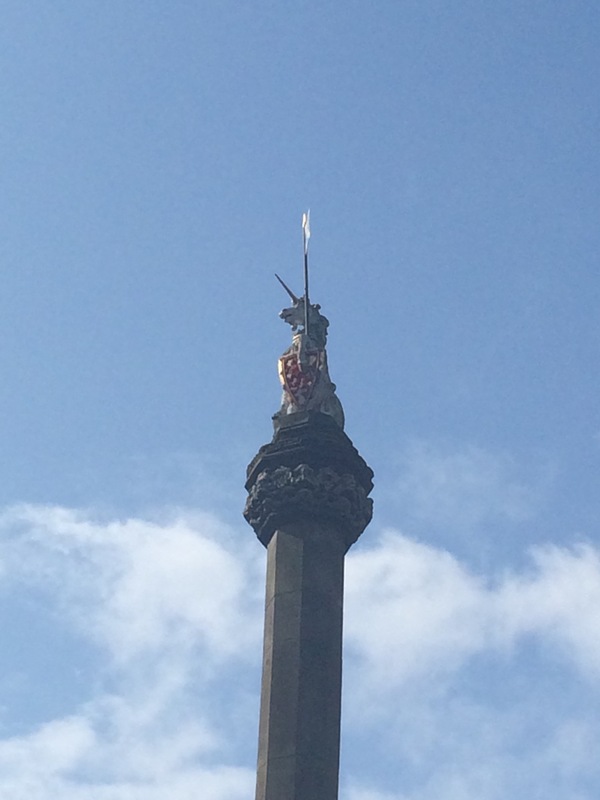 James VI/I had a thing for unicorns and a thing for building stuff. Consequently lots of buildings are decorated with unicorns. 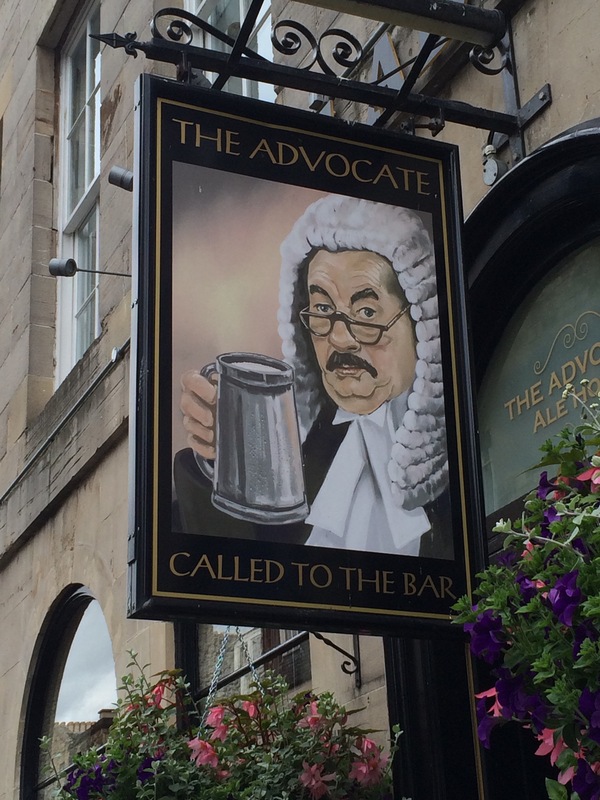 The Scots also love their Rumpole of the Bailey and have wonderful sense of humor. What used to be a church, but it now called The Hub. 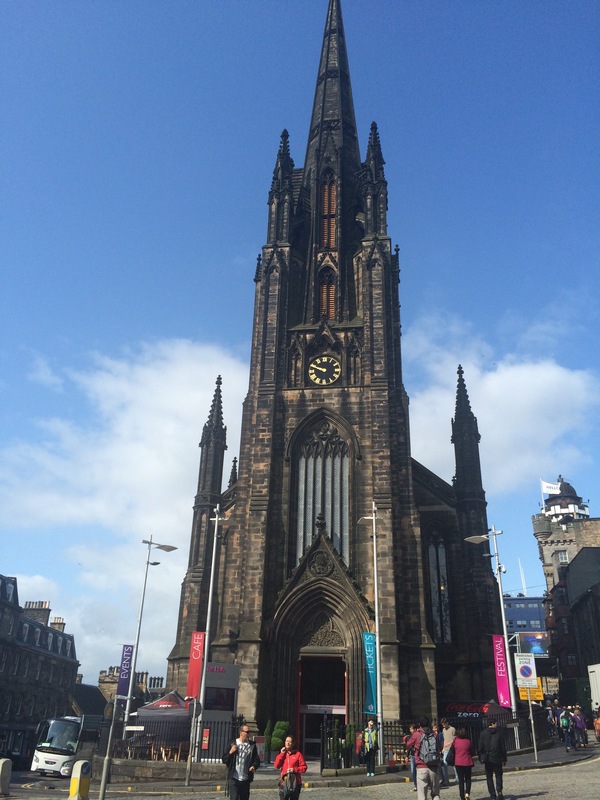 It is the visitor’s center of Edinburgh. 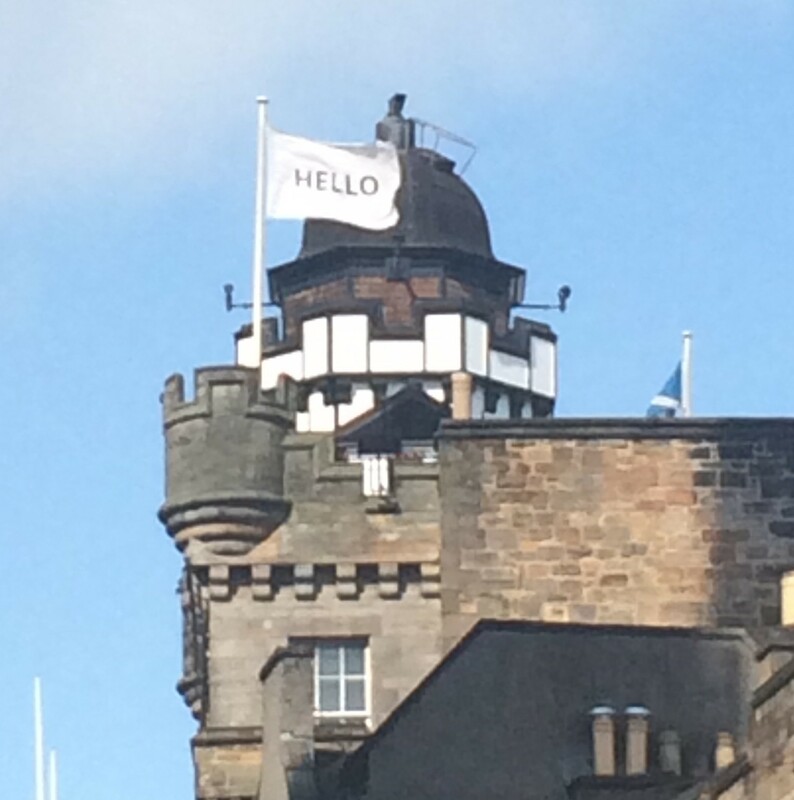 Even the buildings are friendly here! Edinburgh Castle dominates the skyline when you come in from the west. It is a huge collection of towers and keeps positioned on the tallest hill in the city and surrounded by a stone wall. And this is just the front gate! Can you see that bit of scaffolding off to the left? They are getting ready for a Lionel Richie concert! Yes, he still tours. 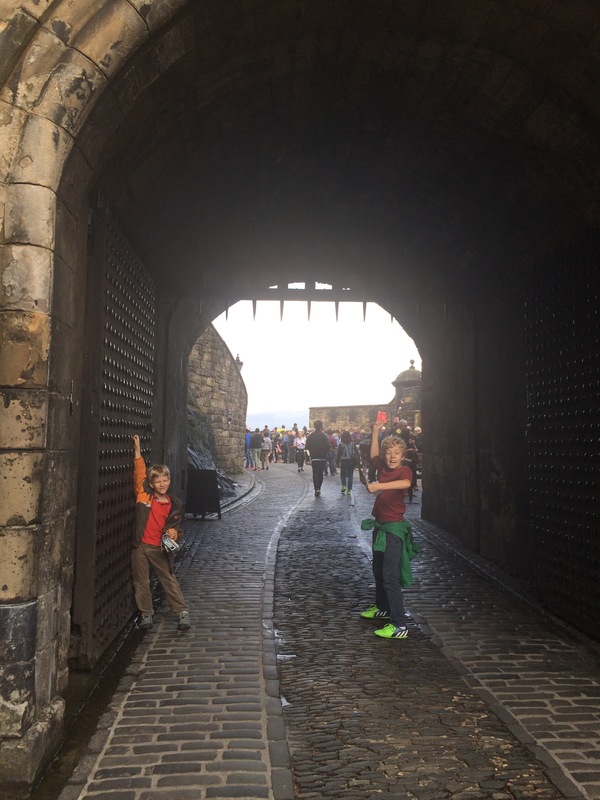 Robert the Bruce and William Wallace flank the very intimidating Portcullis Gate. The Portcullis Gate was built in 1571 and the statues of Robert the Bruce and William Wallace weren’t added until 1929 after they had attained “legend” status. There is archaeological evidence of people at this spot since the Bronze Age! However, more than anything this Castle was built to defend the city. It was a royal seat by 1093 and the position on the high hill overlooking the city and the sea ports made it a very important fortress. It had a central position in the Wars of Independence (1296-1356), what the Scots called The Rough Wooing of Mary Queen of Scots in the 1540s, the Marian Wars in the 1570s, and the Convenanting Wars of the 1600s. 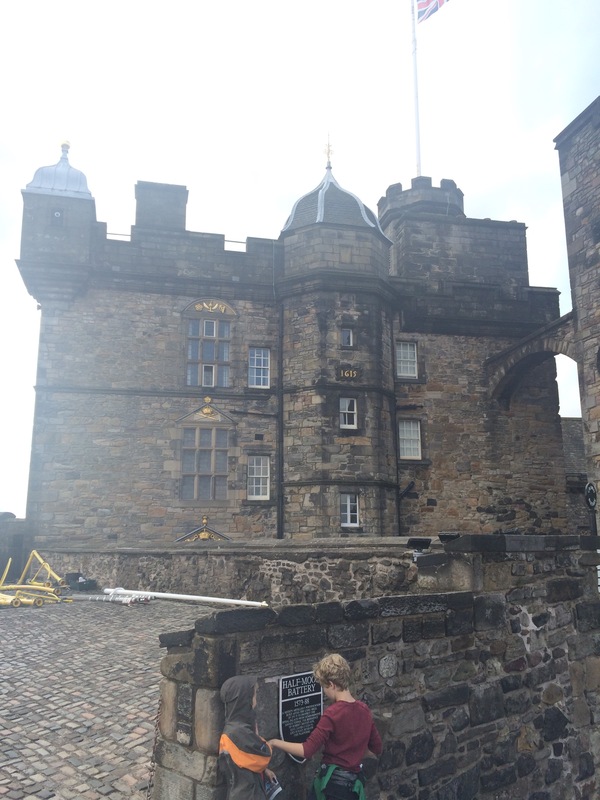 Eventually Holyrood House was built as the Royal Residence and the military took over Edinburgh Castle for good. Barracks were built, the Governor’s House was installed, and the grounds were used for training the army. Now it is a museum. The barracks have become a cafe. 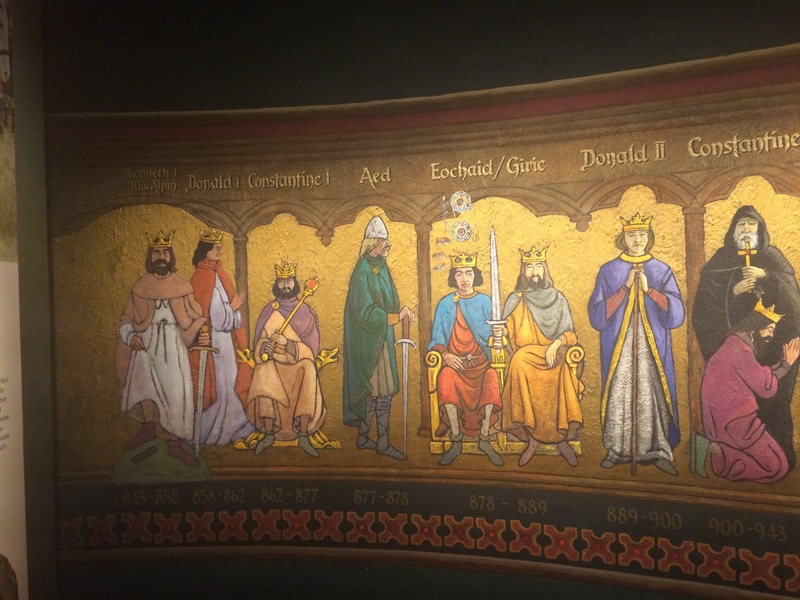 The chapel has become a memorial to Scots who fought and died during different battles and different wars; complete with a book of names by each memorial so you can find your ancestors. Displays and artifacts line the rooms and hallways of the many towers in the castle. 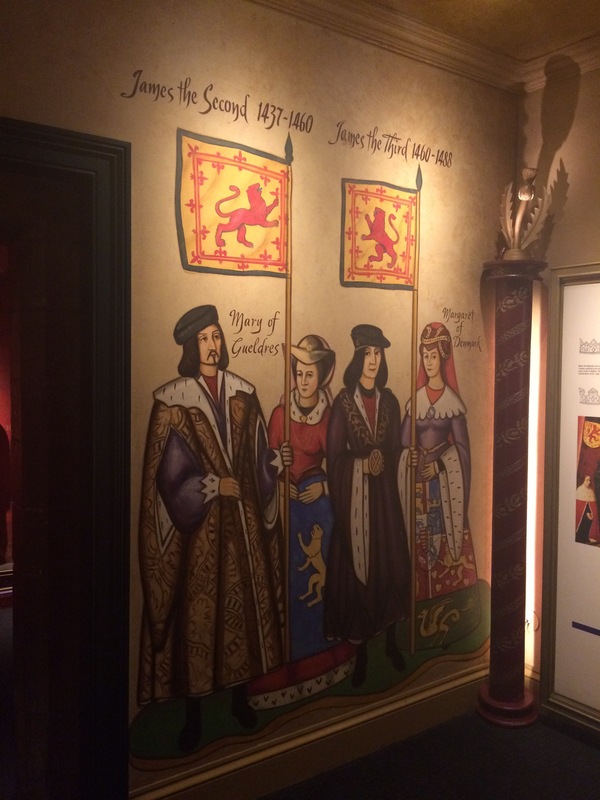 It is still incredibly secure and still houses The Honours of Scotland, also known as Scotland’s crown jewels. The crown, the scepter, the Stone of Destiny, and the Sword of State are all there. Of course they don’t allow pictures and they do tend to sweep you through the room in a crush of people at an alarming speed, but we did get a good look at all the shiny things. 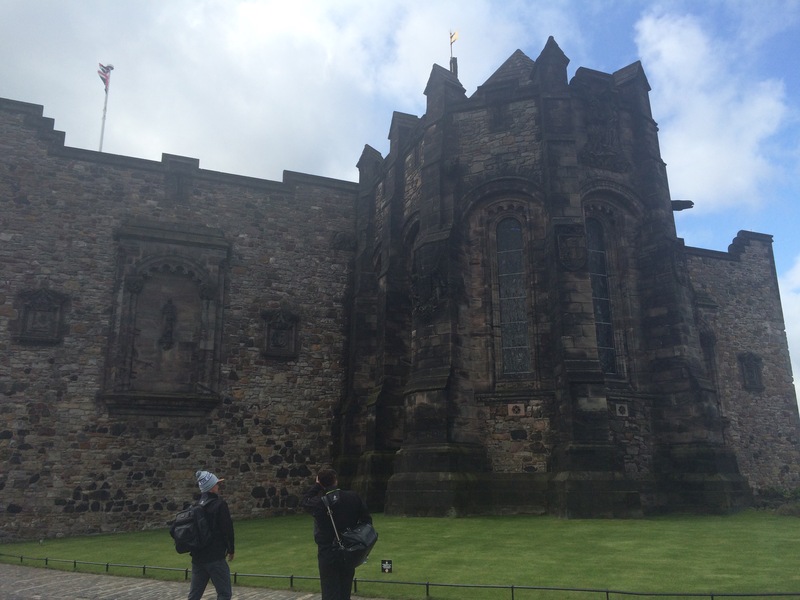 Edinburgh Castle is a symbol of Scottish pride. It safeguards the history of their independence, how they joined the British Crown, and what sets them apart as a people. Just look at the incredible murals and sculptures of their kings and queens. 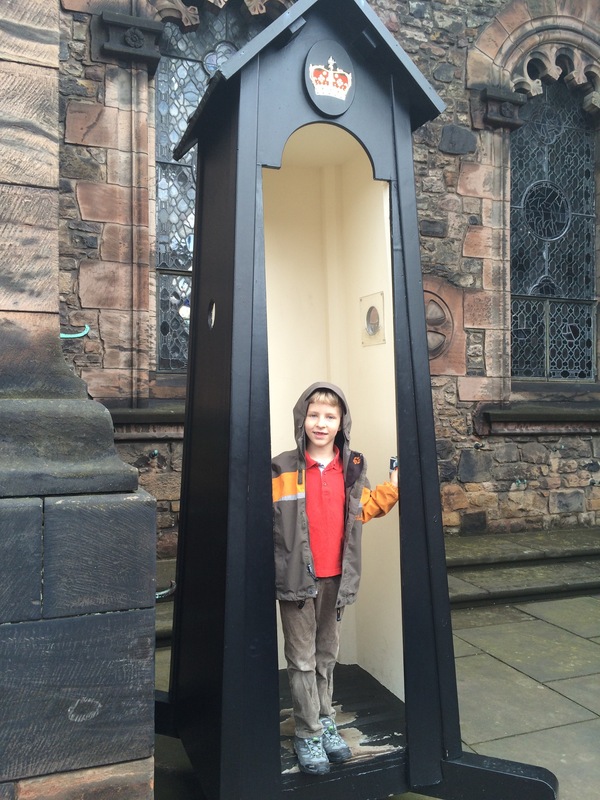 These guard booths stand by doorways throughout the castle. H took a special joy in ducking into them. I had a special joy in taking in the views. 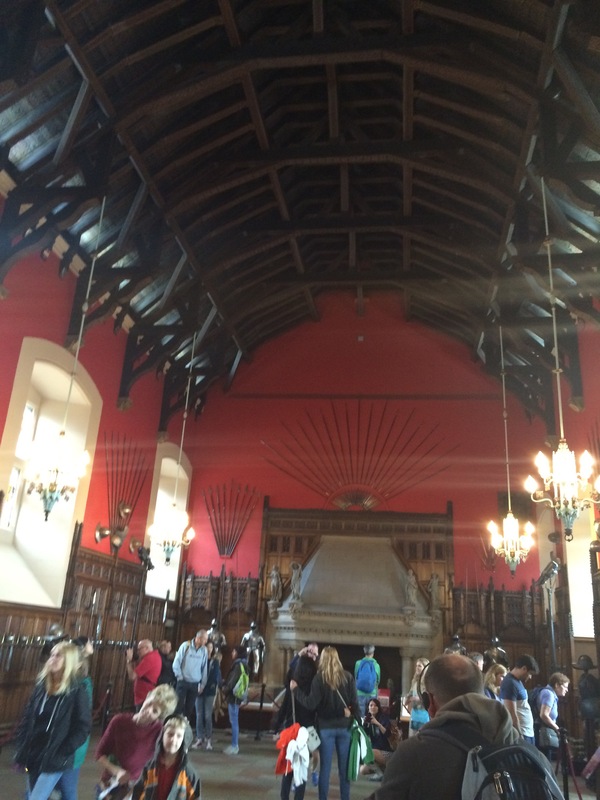 This was our favorite room in the castle. The Royal Palace. Where the kings and queens meet with dignitaries from other countries. 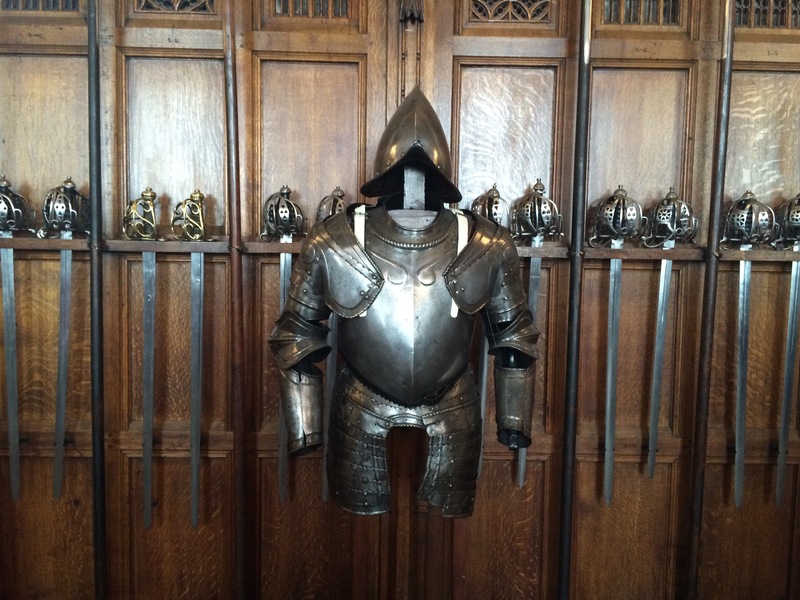 The room was lined with swords and armor from different eras of the castle. The boys loved it! The people in charge had wisely roped off the area. 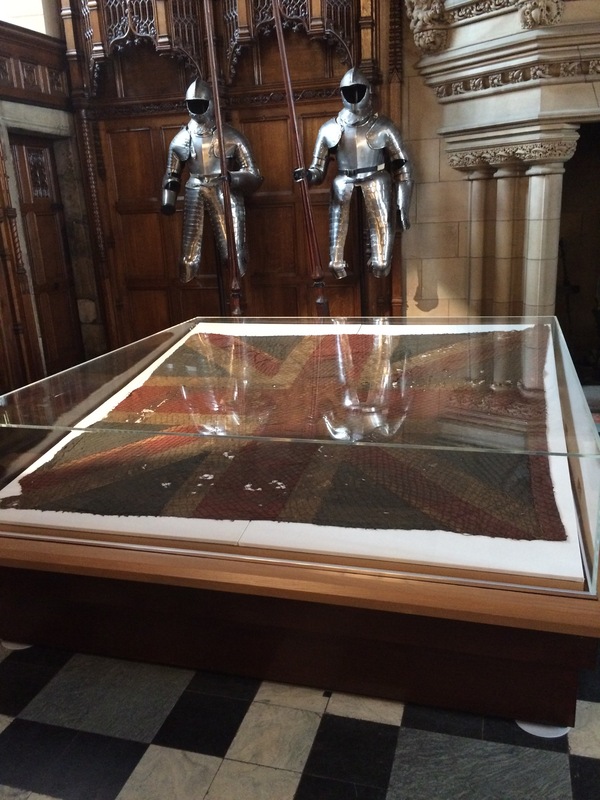 This case holds the British Flag that Wellington had at the Battle of Waterloo. By the way, it has been 200 years since the Battle of Waterloo and the entire island is celebrating it. You’ll be reading more about this in another post. Okay. And this was the coolest thing for the entire day! A demonstration on how to put on a kilt! Take 5 yards of fabric and pleat it in on itself. Slide a belt underneath and the lay down on the fabric. Wrap the kilt around you and belt it in place with your sporran. Then stand up, take off your Levis, and wrap the remainder around your shoulder like a real Highlander. I actually think I could do that. But just in case every tourist shop in the country sells sewn together kilts. Long for men and miniskirts for women. They have even decided that Princess Diana’s tartan color is a fetching and totally historical Princess Pink and/or Powder Blue. You can buy a scarf and matching tam and you will look just like Diana. Honest. Well, maybe drinking some of the Scottish Whiskey will help you with that, too. This look pretty much encompasses the boys’ responses to my jokes. Tune in next time when we explore JK Rowling’s Scotland and Holyrood House!